Suspended Abbey was an official Selection at the Sundance Film Festival, a finalist for the Student Academy Award and received a CINE Golden Eagle Award. It also won over 20 awards and was screened at over 40 film festivals around the world including a screening at Saint John the Divine in New York, the Pompidou Centre in Paris and The San Francisco International Film Festival. -American Film & Video Association. A shimmering, dreamlike journey through a computer-animated mediæval monastery, where the Gothic landscape seamlessly flourishes and deteriorates before your eyes. 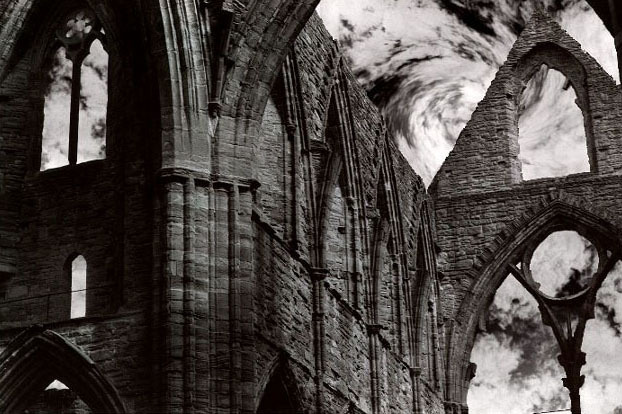 Both haunting and beautiful, the majestic ruins echo with ghostly voices that whisper an eternal and timeless question. I made Suspended Abbey as my MFA graduate thesis film while at California Institute of The Arts in 1991. The film was made by animating digitally manipulated still photographs on a Macintosh computer and then filming each frame off the computer screen with a 16 mm camera. The illusion of the monastery is a result of an electronically produced collage of many differing photographs from various monasteries, abbeys and cathedrals. I took most of the original photographs while traveling in Britain. 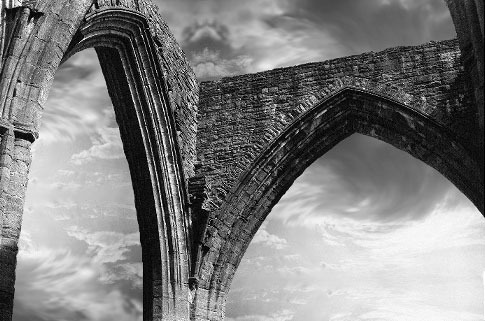 Although the majority of the architecture is based on Tintern Abbey in Wales, I reconstructed the ruins by painting in windows, doors, walls and roofs in order to return the abbey to its 13th century condition. 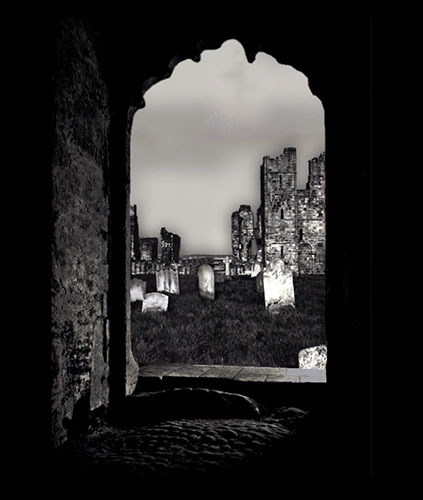 The animation follows the restored abbey through erosion and decay into a modern day ruin. I hope to one day digitize the film for online viewing but for now, the memory of the film on the big screen will have to do since I can’t stomach the idea of seeing it on a small device.